Model Name: Marine Nationale "Snowflake"
Tudor reference 9401/0 and its sister reference 9411/0 featuring a date, were launched simultaneously in 1975 replacing the references 7016/0 and 7021/0. The now well established snowflake hands complement the dial that was available either in blue or black, like the bezel. This diver's watch, waterproof to 200m, like its predecessor, was soon to be noticed by armies around the world and it was no surprise that the French Navy used the new reference to equip their troops. In production for almost 10 years, the MN version of the reference 9401/0 is amongst the most sought after Tudor watches. Finding one in good condition that can prove its military provenance is a real treat and doesn’t appear very often. The present example, from the most attractive “Blue Snowflake” version is further accompanied by a copy of the military ledger that mentions the case number of the watch, 866’142, along with the name of the submarine on which it was used. The Doris, was a Daphné-class French submarine that cruised the seas between 1964 and 1994. The origin and excellent condition of this military watch along with its confirmed provenance makes it a great watch to be added to any collection and its robustness and accuracy makes it the perfect companion to enjoy on a daily basis. Almost twenty years after Rolex was founded, Hans Wilsdorf established Tudor with the intention of making more affordable watches without compromising the quality for which Rolex was renowned. Tudor was named after the British Dynasty that ruled England from 1485 to 1603, and their symbol came from the "War of Roses." After interchanging Rose and Shield symbols for a number of years, the firm replaced the Rose with the Shield logo from the 1960s until today. 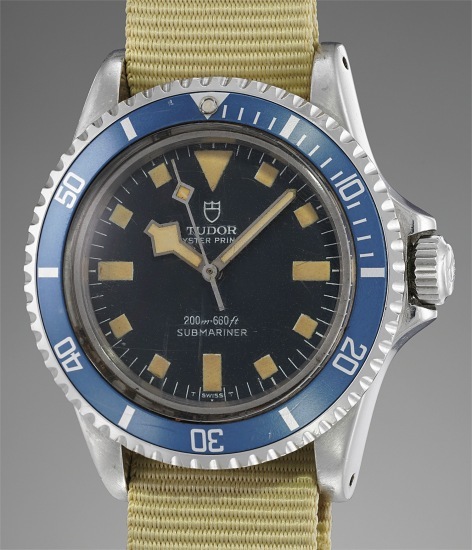 Some of the most recognized vintage models made by Tudor include the Submariner, a waterproof model first introduced in 1954, the Oysterdate, the earliest versions of which were nicknamed the "Monte-Carlo," the Heritage, which included the date at 6 o'clock, as well as the Pelagos, which translates to "deep sea" in Greek.